A basketball club in Ilkeston is celebrating its 50th anniversary by inviting former players to compete in an all-star game. Ilkeston Outlaws Basketball Club, formerly the Old Houghtonian Hawks, will commemorate the milestone across the weekend of September 10-11. The matches will take place on the Saturday in Kirk Hallam followed by a ticketed event at the Seven Oaks Pub in Stanton on the Sunday from 3pm. Former player Bob Prati was one of the group of school kids who first played for the club half a century ago and helped organise the anniversary. He said: “I’m very much looking forward to the anniversary. It’ll be great to see people who I’ve not seen in 20 years or more and trade stories of our playing days. The club was formed in 1966 with the majority of its players made up of pupils from the Blessed John Houghton RC School in Kirk Hallam. Woodwork teacher Paul Booth played a significant part in getting the players together, training and setting up the club before its first game. They would go on to lose that first game by a considerable margin - 121-14 - against Bestwood A in a game that lives long in Prati’s memory. “It was a difficult first game,” he said. “They were a very good side who had dropped down in the second division because they’d changed their name. “We were two clubs at different stages. They had nice kits and we were in our handmade tops that my mum coloured and cut the numbers out for. “We were not quite 15 and we were going up against seasoned national players. We were completely out-played. They were bigger, stronger, faster. “I did not get a single point. We lost heavily in the next game too but towards the end of that first season we won two or three games and got more into it. “The next season we finished half-way up the table. We had a good feed of players coming through from the school where Paul Booth was still working. Prati, now 65 and residing in Stapleford, is Italian-born and lived in Kirk Hallam from the age of three and was first drawn to the sport by the Harlem Globetrotters. “I was also quite tall for my age,” he said. “I thought this was the sport for me. I was 5ft 8in at the age of 14 but didn’t grow much more. “I was a quick player with a decent shot and we used to hit teams on the break. I finished top scorer in one season when I averaged 36 points a game. Prati’s team won Division Three and got to the final of the Sherwood Shield but counts a cup match against a USA Air Force base as one of his fondest memories. “They had some superb basketball players and I think the final score was 90-60 to them - but I scored 50 of our points. It was just one of those days that went my way. “I won’t forget that day. It was superb. The match was good but the occasion around it was something I’ll remember. It was such a happy occasion for everyone,” he said. 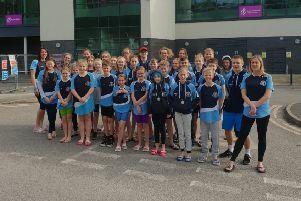 The club now has grown to more than 100 members with U12s, U14s, U16s, U18s teams as well as three senior men sides and senior women’s team that play in Maid Marion and Leicester League. Whats more, four players have been successful in securing selection for county squads. Prati added: “I’m immensely proud of what we have achieved after setting the club up all those years ago. When you think it was only seven of us now there are so many involved. Further details of the club’s 50th anniversary can be obtained from www.ilkestonoutlaws.com or queries directed to Nicola Surgay at n.surgay@ntlworld.com.